In Eric’s house there are too many elephants – in the living room, in the kitchen, in the bathroom, even in his bedroom! The elephants take up a lot of space, but Eric loves every one of them. So when his mum says they have to go, Eric has to come up with a gigantic solution to the elephant problem. 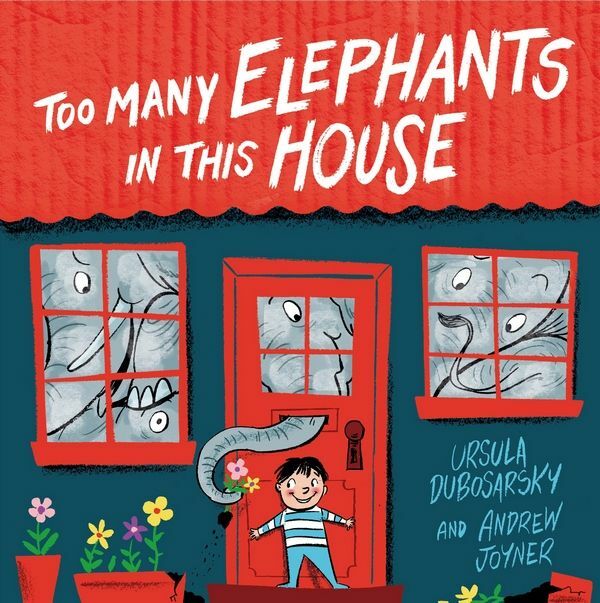 Too Many Elephants in this House is the latest from author Ursula Dubosarsky and illustrator Andrew Joyner, who previously teamed up for the very funny The Terrible Plop. Children will be automatically attracted to the pure silliness of this book. The fact that there are too many elephants in Eric’s house is stated plainly, as if it is a normal and likely situation. Likewise, it comes as no surprise that the elephants are very helpful. The elephant in the living room helps Eric build block towers, the elephant in the kitchen is very good at making toast and the hallway elephant is always up for a game of hide-and-seek. I particularly like the illustration of a whole herd of elephants singing Eric to sleep. Kids will love (and I suspect will fully understand) Eric’s imaginative solution to the elephant problem. Andrew Joyner has done spectacular illustrations for this book. Eric is a chipper little guy and the elephants are beautifully expressive. Special mention must be made of the sensational end pages (below) – it’s a true elephant sandwich. Too Many Elephants in this House is suitable for children aged three years and over. Find it online at Readings.